We currently have vacancies for a 1st soprano and a 1st tenor. Email info@cuore.ie to arrange an audition. Please include your voice type and details of your previous experience. Prospective members should have choral and/or instrumental experience and a good level of sight singing. We have exciting plans for 2019, including concerts in Dublin, competing at a festival in Ireland, and leading a performance of Spem in Alium abroad. 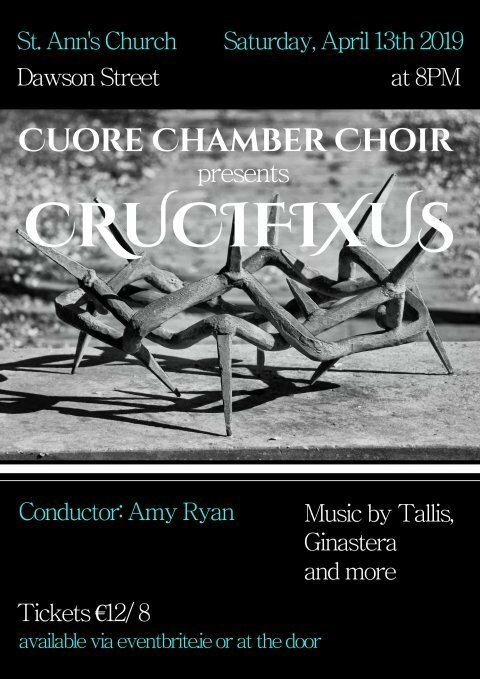 Repertoire for the spring 2019 term includes Tallis and Ginastera Lamentations and Lotti Crucifixus. Cuore would be happy to answer any questions you may have in relation to the choir. Please email info@cuore.ie.